Need help with your closets, kitchen, bedrooms, spare rooms, craft rooms, children’s rooms, storage areas, garage, basement, attic, photographs, keepsakes, or even the whole house? New baby? Loss of a family member? Move to a new home a year ago and still not unpacked? Downsizing your empty nest? Single parent? Do you need help understanding new technology? Would you like someone to help you sort everything out? Those piles can become files! Not sure what to keep, how long to keep papers, and where to keep them? Elaine will work with you to personalize and create your ideal paper and filing systems. Elaine knows how to make downsizing less complicated. When you or a loved one decide to move into a smaller, more comfortable and convenient home or assisted living facility, we can help you through the process. Whether you’re an empty-nester or need to right-size for economical reasons, Personal Touch Organizing can help you categorize your belongings to fit them into a more comfortable lifestyle. I have a team of dedicated professionals that can help get the highest price for your items and can arrange for storage or shipment of pieces to other family members. When Seniors can no longer live safely and securely in their homes due to illness or aging, Personal Touch Organizing gives families peace of mind by coordinating all the details of relocating. The move to a retirement community, nursing care center, hospice, or even another family member’s home can sometimes be overwhelming for families. It’s more than just packing boxes with household items and selling a home. It’s also sorting through years of wonderful memories, precious heirlooms, treasured antiques, and personal belongings. When it comes time to sell your home, 76% of realtors recommend home staging. By using home staging, you will command a higher asking price for your home, as well as shorten the time it takes to secure a sale. Let Elaine stage your home for resale and reduce this major stressor in your life. At the consultation, we walk through your home and provide suggestions on how to maximize your home’s assets. This process usually takes 90-120 minutes. If you should choose to continue with the staging process, we will return at a later date to implement the recommendations we made. This may include furniture rearranging to optimize space, neutralizing with paint color, and de-cluttering, and accessorizing to create a designer look. After we transform your house into a model home, simply sit back and watch it sell quickly for top dollar. From the largest of events to the most elegant of dinner parties, Elaine can bring your event to life! Her experience in organizing corporate sales meetings and trade shows, fundraising events, and themed parties make Elaine the ideal choice. No event is too large or small. We even plan children’s themed birthday parties. Lost an important phone number? Looking for a service provider’s business card? Getting your holiday card list ready with family and friends addresses? Provide us with a stack of business cards, Christmas card envelopes, random post-its and loose leaf paper with your family, friends and professional contacts and allow us to provide it to you organized and typed so you will never have to search for that number again. Elaine will create your personalized list of names and numbers customized for your easy access and retrieval. 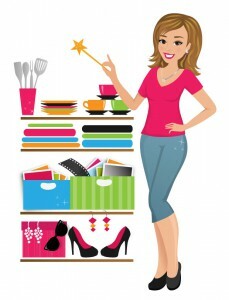 Seasonal organizing tips emailed to you! Contact Elaine for more information and find out how to get started on your organizing project today!